RANDINT(length of list, lower limit, upper limit). The result is a list. 1. Start by selecting the header cell for Column A. Press [ Toolbox ], 5 for Probability, 4 for Random, 2 for Integer to call the RANDINT function. A list a generated, so no equals sign is needed. Enter 100 for the length of list, 0 for the lower limit, and 100 for the upper limit. The result is RANDINT(100,0,100). Press the soft key ( OK ). 2. Name Column A DATA. Go to the header cell, enter DATA, and press on the soft key ( Name ). 3. Press the [ Home ] button. Select the D1 variable from the Statistics 1Var app by pressing [ Vars ], the ( App ) soft key, then Statistics 1Var, then Numeric, and D1. 4. Continue by entering ≔DATA. (colon, equals, DATA). The complete command should be Statistics_1Var.D1≔DATA. 5. 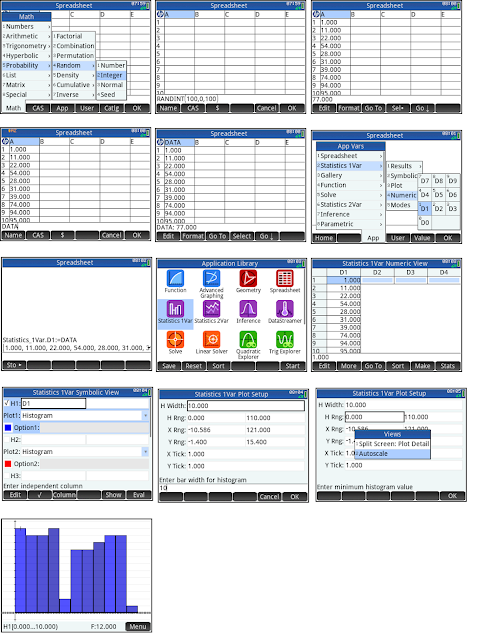 On to the Histogram: Press the [ Apps ] and choose the Statistics 1Var app. You’ll be taken to the Num view and D1 should be filled in. 6. Press the [ Symb ] key for the Symbolic view. Enter D1 for H1 and select Histogram. 7. Press [ Shift ], [ Plot ] (Plot Setup). Change the H Width to 10. 8. Press [ View ] and select Autoscale. 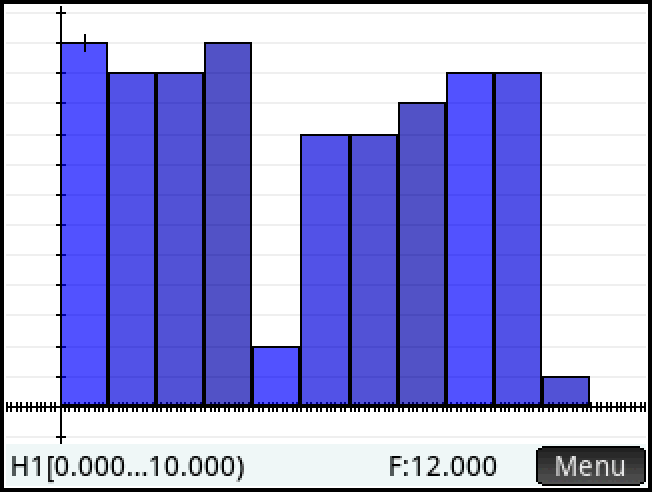 This Histogram is complete. This concludes Lesson 5. I plan to post additional lessons in the near future. This blog is property of Edward Shore, 2015. Thank you very much for this tutorial series. I'm taking Intro to Microeconomics and using the HP Prime calculator spreadsheet app to program some repetitive calculations. Is there a way (that I'm obviously missing) to save a spreadsheet file and later load that file? Or is the spreadsheet app completely working memory based? Well, I just found the answer to my own question. With the spreadsheet constructed, return to the APPS screen and select "Save" and provide a name. To load, simply highlight the newly saved spreadsheet and hit "Enter". Sorry for any inconvenience.